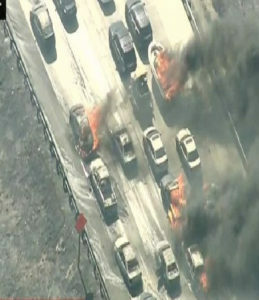 Nearly 1000 people are missing and presumed dead and many others found fried in their vehicles, both in Paradise and on the beach in Malibu – not by fires, but apparently from sophisticated directed energy weapons. For this show, we are exploring if directed energy weapons are being used. Joe Anthony, a well known astrologer and psychic, along with Rebecca Campbell from Olympia, Washington, and others join me as we discuss the California fires in Malibu and Paradise. For the first time in American history, the official accounts of these so called “fires” do not add up to the reality that hundreds of people were apparently murdered by directed energy beams where there were no fires. What is the purpose behind these fires? Why aren’t these fires being treated as a crime scene? Why are people in California being mass murdered? Please note: Please look at this picture carefully. There is NO EVIDENCE of any fire on either side of the road around these cars which were trying to escape from Paradise California. Yet the cars are badly burned and/or melted with their occupants burned alive. These poor people died as a result of particle beam weapons. Therefore their deaths were NOT “natural”.